Five decades after Indira Gandhi made history by becoming India's first female prime minister, gender disparities in income and employment remain pronounced in the country. The 2012 World Economic Forum's Gender Gap Index ranked India 123rd out of 135 countries on economic participation and opportunity. Women earn less than men and are more likely to work in the informal economy or do unpaid work. Improving opportunities for women to earn and retain income will spur economic growth and foster a more inclusive and fair society. 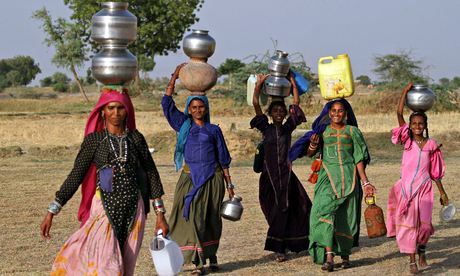 As Geeta Rao Gupta, the India-born president of the International Center for Research on Women, noted in an interview with PBS: "you can trigger social and cultural change in women's status by giving women increased economic opportunities." For one thing, women typically spend a higher proportion of income than men on their children's education, so increasing their participation in the labour force can result in higher school enrollment for girls, producing what the IMF calls: "a virtuous cycle, when educated women become female role models." One initiative that seeks to support such role models is the Young Women Social Entrepreneurship Development Programme launched last September by the British Council in partnership with Diageo, through the latter's corporate social responsibility initiative called Plan W.
The programme provides advanced social enterprise training to female master trainers who will then cascade their knowledge by training aspiring and early-stage female social entrepreneurs in India. The goal is to train 1,200 women entrepreneurs in the first year. The programme is also delivered with the support of 14 local partners, which include management institutions, NGOs and social enterprises. Among the latter are SEWA, one of the largest co-operatives in Ahmedabad; Jaipur Rugs, which employs thousands of women, and the Nedan Foundation in remote Assam (Bodoland), which markets and sells craft products produced by vulnerable indigenous women in order to reduce poverty and environmental degradation. "The British Council is committed to finding new ways of addressing gender inequality," explains Paula Woodman, the organisation's Social Enterprise advisor, adding that "social enterprise are a valuable a tool to achieve fairer, more inclusive economies and societies because they are agents for positive change and empowerment of disadvantaged people, including a proportionately high number of women." Around the world, social enterprises are more likely to be led by and employ women than other businesses. In February, Woodman attended a training session offered to 24 master trainers at the prestigious Indian Institute of Management Kozhikode (IIMK), which was contracted to design and deliver a six day training programme co-ordinated by Professor Sumit Mitra. Prior to the design phase, IIMK conducted a detailed training needs analysis through questionnaires and phone conversations with the participants. The training sessions were designed to upgrade the skills and knowledge of the master trainers and equip them with the necessary tools to build competencies on innovative approaches to social entrepreneurship. The programme focused on core entrepreneurial competencies such as generating ideas, assessing viability, launch pad networking, management tools, business plans and fund raising as well as topics such as e-marketing, sustainability and work life balance. A mixed method was used for the training - brainstorming, participant observation, case study, group work and group presentation, visual aid, practical experiences and field visits involving IIMK faculty, guest speakers and experts with evening interactions involving some of the successful social entrepreneurs. The programme was delivered by India and UK trainers. Craig Carey from Social Enterprise UK provided a global perspective, and said, "I was really impressed with the calibre of candidates chosen from across India for this course. There was a real appetite for learning and passion for working together as a group, to make a real difference in women's lives by helping them to set up their own social enterprises." Another master trainer named Medhavi founded the Happy Hands Foundation in 2009 in order to revive traditional arts and crafts, empower rural artisans and mentors women and young people seeking to establish their own community social enterprises. She explained that she participated in the programme "to gain a more in-depth perspective on entrepreneurship. I believe that such training programmes help build capacity of not only an individual, but an organisation as a whole and introduce us to a network of entrepreneurs." She added that, "I have been equipped with certain skill sets which would be crucial in building not just my own enterprise, but the several small-medium enterprises we have nurtured." Over the next three months, Medhavi and the 23 other master trainers will conduct 48 cascade workshops that will provide face to face training for 1200 women. These three-day workshops have elicited keen interest from NGOs, women self-help groups, management students and women working in the corporate sector. Reflecting on the programme, Craig Carey of Social Enterprise UK adds: "From the recent visit to India, it was clear that there is huge potential to share our experiences with dedicated social entrepreneurs as well as organisations like the British Council – but equally clear that we in the UK also have a lot to learn from this exchange. There is a common bond between us that we are all trying to address key social, community or environmental issues through a social enterprise approach rather than a traditional business or NGO model."